The National Audubon Society recently recognized our very own Hunter Lovins as an influential environmental pioneer. Hunter was chosen as one of this year’s recipients of the prestigious Rachel Carson Award, which honors visionary women whose dedication, talent and energy have advanced environmental educational locally and globally. The Award ceremony, which was emceed by NBC News environmental affairs correspondent Anne Thompson, took place May 22, 2012 at the Plaza Hotel in New York City. The Award is named after Rachel Carson, author of the seminal Silent Spring and a forerunner of the modern environmental movement. This year’s Award was particularly special, as 2012 marks the fiftieth anniversary of the book’s publication. 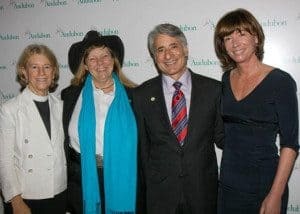 Established in 2004, the Rachel Carson Award has raised more than $1,000,000 to back Audubon’s Women in Conservation Program as well as the organization’s campaign to protect the Long Island Sound. In addition to Hunter, the Reverend Canon Sally Bingham and Janette Sadik-Khan were also recognized: Bingham for her leadership of the Interfaith Power & Light campaign, a popular religious response to global warming; and Sadik-Khan for her spearheading of a major overhaul of public transportation in New York City to make it safer, flexible, and more sustainable. Past recipients of the Award include actress and environmental activist Sigourney Weaver; founder and executive director of Sustainable South Bronx, Majora Carter; and producer of “An Inconvenient Truth,” Laurie David. So why Hunter? Hunter has been referred to as a Millennium Hero for the Planet and Green Business Icon, but she is also a master of diversity, embodying the same integration and innovation championed by her sustainability work. For the past three decades, Hunter has fought tirelessly to bring sustainability into the business world, working one on one with companies to help them incorporate the value of the natural world into their business models. She continues to consult with companies of all sizes, with past clients including Interface, Clif Bar, Wal-Mart, and the International Finance Corporation. More than a consultant, however, Hunter is first and foremost an educator. 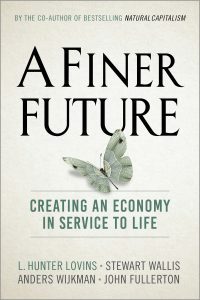 In addition to publishing numerous books and articles, Hunter has helped establish several Sustainable Management programs at colleges across the U.S., and currently serves as faculty at Bainbridge Graduate Institute, the University of Denver, and Bard College. At her non-profit consultancy firm, Natural Capitalism Solutions, Hunter mentors students and professional interns while providing them with a supportive, hands-on learning environment to launch their careers in the environmental field. Hunter is honored to receive the Rachel Carson Award, and looks forward to adding it to her collection, which also includes the European Sustainability Pioneer award and the Right Livelihood Prize, an alternative to the Nobel Prize.